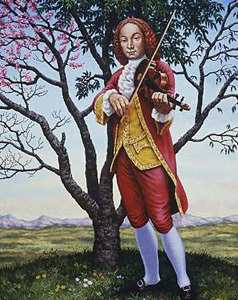 I'm fascinated at how most upper string players are taught to stand in order to play violin or viola, and how that has originated historically. 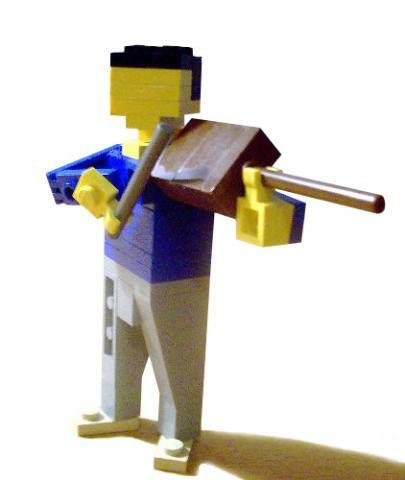 Just to illustrate my point on how virtually everyone turns out at least one leg while playing violin, here's a gallery of images through the ages. Some are exaggerated artistic renderings, some are photographs. It's been happening for hundreds of years, and perhaps, it's not the only advantageous way to stand. We see the turn out and the staggered stance- all of his weight is on his right leg. This is obviously an illustration and not a photograph, but it looks painful. Right leg seems more turned out than the left here. 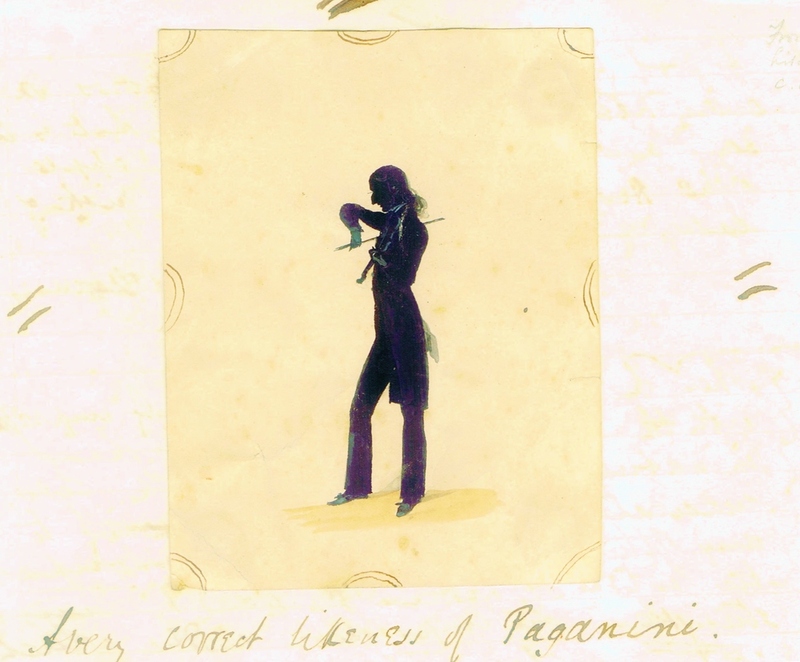 Perhaps a more realistic rendering of Paganini-his knees/legs are almost pointed forward, but notice how much more weight is on his left (your right) side? Also notice how a certain posture can be interpreted as showmanship! It's interesting to imagine how long he held this pose to get photographed back then. This image is from Book 1 of the Essential Elements series. External rotation of the hips plus a staggered stance. With one foot so far in front of the other, it's interesting to think of how challenging this might be. 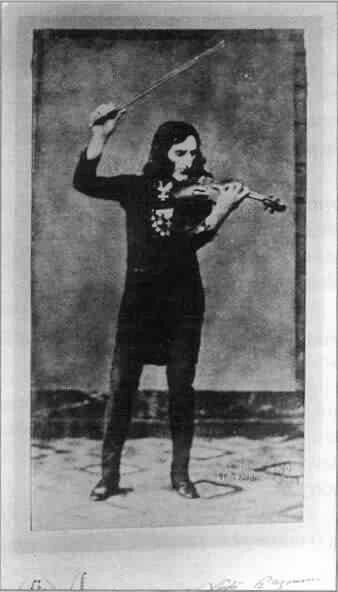 Great violinist...standing on one foot. Even violinist and healthy playing pioneer Yehudi Menuhin turned out his legs. He was a serious yoga student and wrote an excellent book on violin technique and ergonomics. The turnout and split stance doesn't seem to be so pronounced here-kids are still learning about their bodies, and still may have a forward facing leg/hip pattern. Also, the children are so young that stance may not have been emphasized. We can see that this adorable little girl already has the unbalanced posture/turnout. Is it from violin training? Or from life? It's impossible to say. "Showmanship" in posture-taking on a strange stance, and then adding facial expression for drama, artistry, and whatnot. While we can't see her feet, I can almost guarantee that she is wearing super high heels. She's also in quite the backbend, which would not be comfy balancing on a heel the width of a pencil! This is the perfect exaggeration of the tortured-gypsy-devilish-artistic-showmanship persona. Crazy posture, as though taken over by the devil, is the norm. Fortunately, Shaham looks nothing like this in real life. 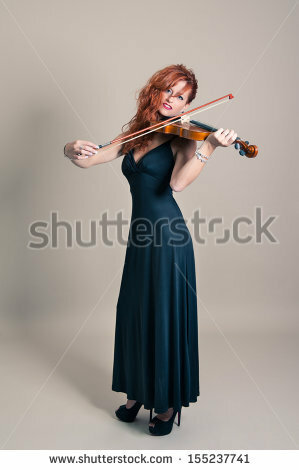 Always good to see a stock photo model in 5 inch heels trying to hold a bow. British violinist Ben Lee, in a fierce backbend and mini squat stance position. He also has a jewel crusted electric violin. Yehudi may have been a serious yogi, but he turned out his feet too. It's how it's been "done" for hundreds of years. We can see that this pattern is not just limited to any one specific training in violin or viola, but is instead a timeless practice extending far beyond any one technique or tradition. There's a combination of "showmanship" histrionics and drama, which sometimes makes for unusual stance and posture. In addition, some of these images may be taken while the player is moving dynamically, and may not illustrate a specific static posture. There are a few constant themes though- legs tend to be turned out in most images, and many people have a split stance with one leg in front of the other. 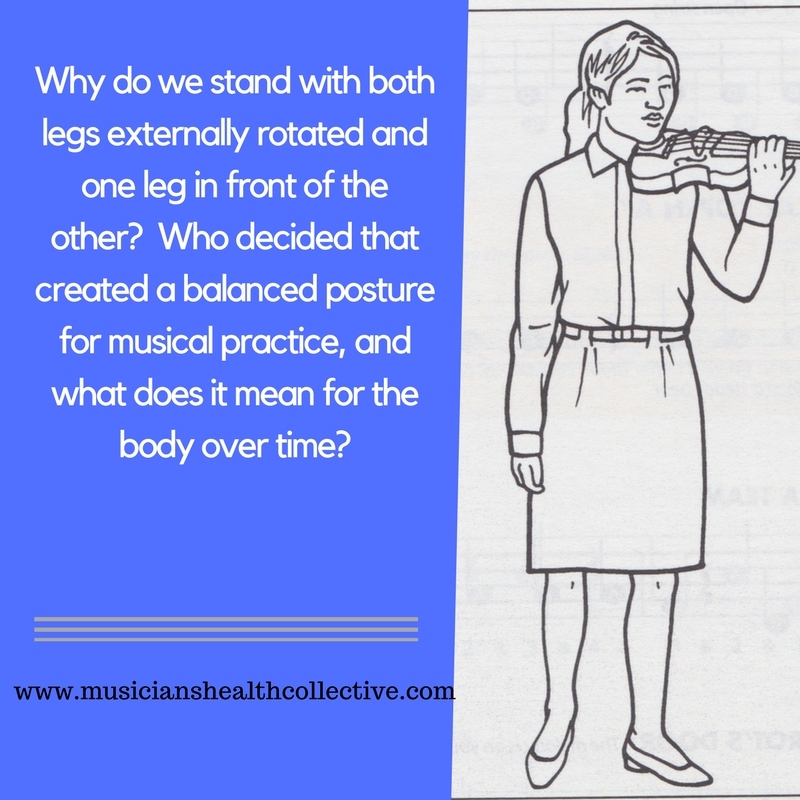 The other common theme in talking about musical instrument alignment is balance: different teachers will speak of different alignments that are the "best" way, as long as the student is in balance, but what does a balanced standing posture even mean? Is it your fault if you play with one leg in front of the other or in turn out? No. Are you definitely going to hurt yourself or your students if you teach this way? Not necessarily. But the question I have is: why? 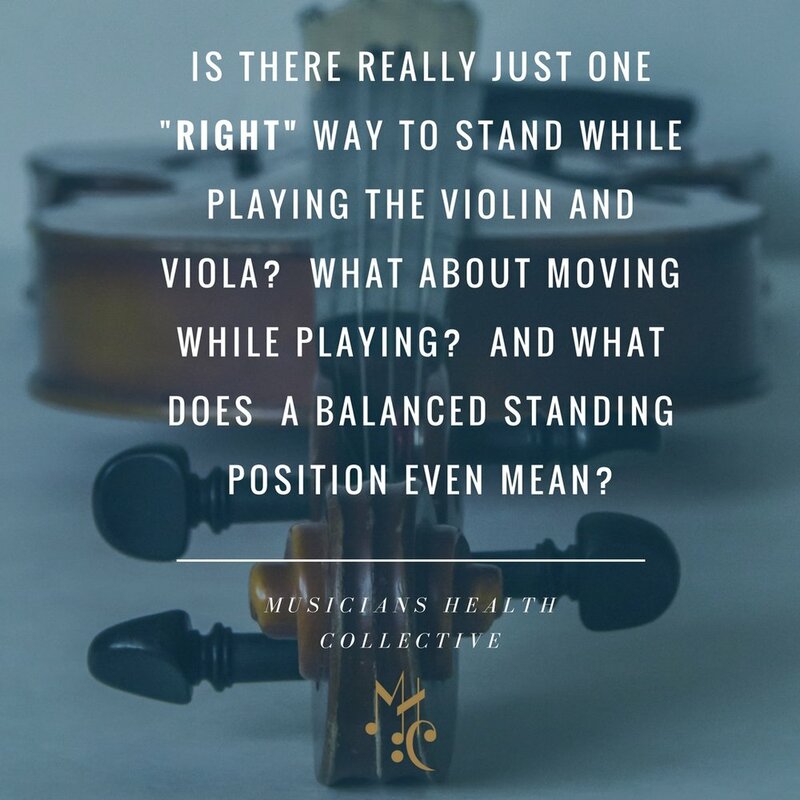 If having one leg in front is "counterbalancing" the weight of the violin or viola, what is happening to the rest of the body to accomplish that, and what are the long term effects on the body? However, as biomechanists, kinesiologists, and music educators refine their understanding of the body, I suggest that we adapt our practices accordingly and start to inquire, "why." Many of these were (and are) great musicians, and perhaps they never played with pain in their hips, spines, shoulders, or necks. However, I know many folks who do work with pain while standing and playing, and so I suggest a questioning of a "one right way to stand" approach. Movement while playing is natural, but it's also good to ask what your baseline posture is and whether it's serving you, in and out of the practice space. I started my humble music career as a Suzuki violinist, beginning at the age of 6. While there are many useful and important things I learned in my early training, standing position was one that has posed confusion as I've aged. Let me explain a bit more, for those non-violinist or violists out there. 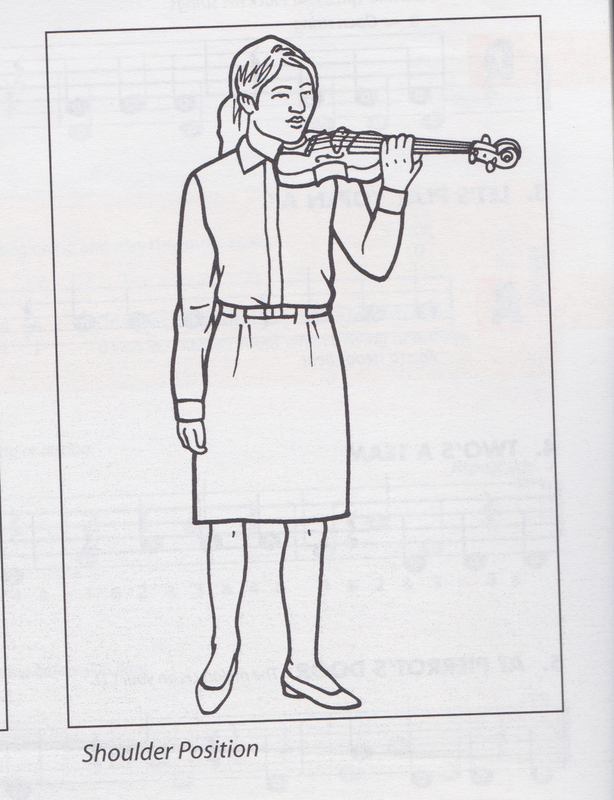 This is a perfect example of learning "proper" violin stance. Start with the feet together, then turn the feet out (externally rotating hopefully from the hip, hopefully) and then step the left foot forward. When one learns beginning violin, often one is told to turn the feet out and step the left foot forward. I learned this way, and stood this way for a long time. (Over 15 years, at least). A few years ago, I started noticing that in yoga, pilates, and weight training, we were told to have both feet pointing forward, at least sometimes. I instead wondered, why do I always turn my feet out when I play, and does it actually serve me? I have since started experimenting with this concept. This adorable image is from Shirley Givens' violin series, showing that left foot turnout. In addition, the illustrated girl puts much more weight on her left foot, enhancing the asymmetry of the stance. So what's the big deal? Our feet naturally point forward or with a minimal turnout, and you may already remember that when you walk with your feet extremely turned out, there are potential consequences for foot, knee, and hip issues. (In addition, when feet point forward rather than externally rotated, the musculature of the foot is better able to support the body in standing and walking, and the ankle joint is able to articulate more fully.) From a biomechanical perspective, I don't understand why music educators have been teaching students to externally rotate their hips while standing, and I definitely don't understand why one foot needs to be in front of the other. I just don't. (Who decided this was a good idea?) However, I don't only care about the feet, but I care also about what is happening in the hips too. When one hip is perpetually externally rotated (left hip), we can exaggerate that asymmetry out of the practice room, and in our daily walking, standing, and movement lives, even if we don't intend to. That means that one set of external hip rotators is constantly working more than the other set, which can affect the muscles, bones, and connective tissue over time. What does that mean? 1. My left hip has consistently turned out more than my right, whether I'm in music mode, standing, cooking, walking, running, etc. This can simply manifest as the foot turning out, at least in appearance. Both hips want to turn out in standing though. I've been working on gently bringing the legs back to neutral, and found that to be helpful. 2. This in turn can cause my left external rotators of the hip and the low back muscles to be unruly. (Muscles include my gluteus medius, TFL, Quadratus lumborum, and the iliotibial band of fascia. 3. I also have the beginnings of a baby bunion on my left foot which may be impacted by the external rotation of the hip. 4. From a combination of asymmetrical music-making, left side dominance, and a host of other things, my entire left side is loads tighter (less range of motion from sole of the foot up to the shoulder!) than my right, which means that I sometimes have back pain and other issues on just the left side. So what's the solution? Start to get curious. It's also important to remember that correlation does not imply causation- my left hip/back issues aren't inherently caused by the turn out, but I would venture to say that the perpetual external rotation has impacted things. I will say that my pain has diminished exponentially since I've been doing pilates and other movement activities that have challenged my hip range of motion and stability. -How do you stand when you're playing? Where are your feet, knees, and pelvis? What sort of shoes do you normally wear? How might those be affecting your lower body? -How do you teach your students to stand? If you have a specific way of teaching stance, why do you teach what you do? -Try standing differently. Maybe feet closer together, more parallel, right leg in front, both legs in the same orientation...give yourself permission to experiment, and perhaps that will change how you teach. 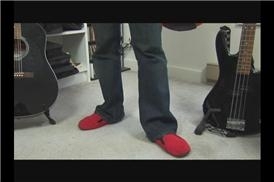 -Do you sit when you practice at home, and if so, what are your legs doing? -If you photograph yourself (or video) while playing, what does your standing look like in context? -Do your feet turn out when you walk/run/play/sit/etc? Start experimenting with changing that setup gradually and see if it changes how you feel. It can have ramifications all around the lower body, specifically feet/knees/hips/spine, but maybe affects other aspects as well. Playing an instrument requires movement within the body- it's not meant to be a static endeavor, but repeating the same position in perpetuity for twenty plus years may not be the best. Here I am with both legs turned out. Notice how my spine is asymmetrically slumped and collapsing back? My pelvis is also tucked, but that is less visible. So I've been in the process of revising my writings from last year about standing posture and alignment for musicians, especially in regards to turn out while standing. I think I wrote 2 or 3 posts last year about it, but here are some things to add (or if you've never thought about it, welcome!). Most of us violinists/violists were taught to turn out our feet (hopefully our hips) when we started our instrument. Some teachers suggest turning out the left foot more than the right, which is a problem in itself, but others recommend turning out both feet. In small doses, external turn-out is not the worst thing, but as a way of standing for 20 years-it's not great. Here's why. I know, my pants are terrific. But seriously, here's one foot forward and turned out. See how the left pelvic bone is higher than the right? How can I stack my spine well on top of that? 1. If you turn out one leg more than the other, your external rotators on that leg will work more than the opposite side, which can create asymmetry between the muscles of the hips, as well as create issues down the line with the piriformis and deep rotators. This also creates an asymmetrical pelvis in the sense that one hip lifts higher than the other. 2. If you turn out one leg more than the other while playing, you may find that the habit extends to walking, standing, and running without your instrument. This is not good for the wear and tear of your bones and soft tissues, especially in response to gait and load. 3. If you turn out both legs, there's a high chance that you tuck the pelvis under in standing and sitting. That can create big issues in pelvis floor muscle issues (hello incontinence! ), and as well as misaligned viscera (uterus, intestines...you know, no biggie). Misaligned pelvis also leads to a misaligned spine, which can transfer to head, neck, and shoulders. Image from Happy Tail, Sad Tail. Notice the rounding of the pelvis and how the sacrum is contacting the ground in sitting? The two on the left are a tucked pelvis. 4. Your tissues, through a process of mechanotransduction, respond to the loads placed upon them. That means your body is adapting to how you stand or sit, whether you want to or not. Even if you or a student is not currently in pain, you may be loading the joints and tissues in a way you don't want to if you keep turning out. 5. There are legitimate medical issues associated with turnout in standing, sitting, and walking. In the "scholarly" article I'm editing, there's lots of footnotes, but let's keep it short: piriformis syndrome, sciatica, osteoarthritis of the knee, bunions, pelvic floor disorder, psoas dysfunction, and back pain, for starters. (If you want to read the scholarly article, it'll be in the American Viola Society journal at some point.) I'm not just making this stuff up. So I care about how your feet are because that's the foundation of standing. Not just standing for musical purposes, but standing at the grocery store, post office, yoga class...you catch my drift. I can talk about this endlessly, but to make change, you can read the 5 or 6 articles I wrote last about this, or just bring your feet to parallel for starters. Notice how the image here has feet in parallel, knees stacked over the ankles, spine over hips, and so on. Foundational good standing starts in the feet and legs, ok? How did we come to this point of turning out our left leg so much while performing? 1. Western civilization used to be one of dancing and military turnout, both of which demand external turnout on a regular basis. While we are no longer a culture of formal dancing, the turn out remains. 2. We learn our habits of standing, walking, etc from our parents/teachers/elders as a child. If you compare your habits with your parents', you'll probably find that you have a similar gait, stance, or way of holding yourself. 3. Musicians, on the whole, resist change. For hundreds of years, musicians have been turning out legs/hips/feet, standing on one leg, balancing precariously, etc. Many notable pedagogues have touted their stance technique as promoting balance. While many of these folks are important teachers and musicians in their own right, our understanding of the body is constantly changing, which means we should change our teaching and habits accordingly. What are the short and long term effects of turn-out? These are some of those external rotators of the hip, which may in fact be asymmetrical contracting, weak on one side, etc. 1. 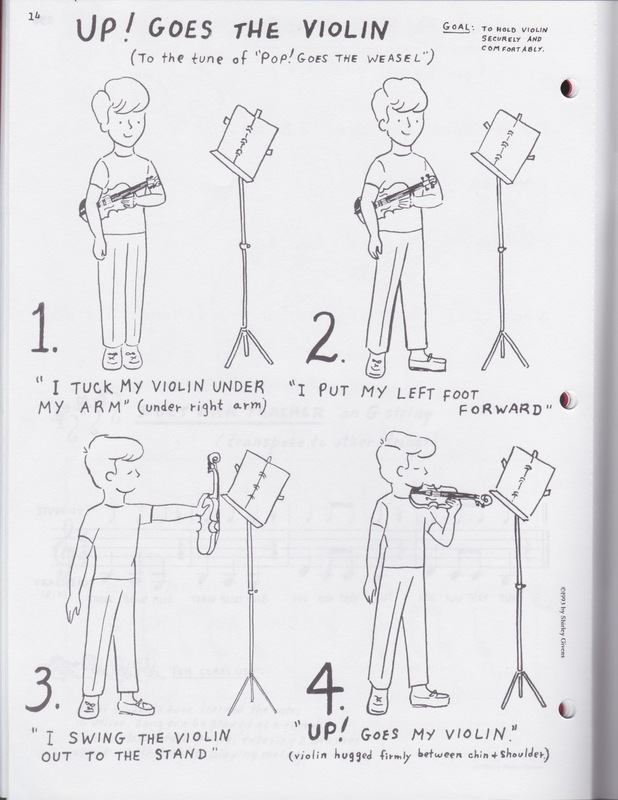 Transference-whether you're a little kid learning twinkle, twinkle, or a grown-up who plays viola and runs, it's likely that your standing habits transfer to all of your other activities. This means that you have a slight turn out when you walk, squat, run, etc. This transference is what can really lead to injury, tightness, and extreme asymmetry down the road. Kids are fortunately very malleable, and their bodies are perpetually changing, as are their abilities to propriocept. 2. Feet-I know I've mentioned it before, but bunions and hammertoes are also correlated with turn-out as well as tight shoes. Also, your feet may be supination or pronating, in addition to the turn out issue, which can compound issues. 3. Knees- When we turn our feet out, we can try to turn out from the lower shin/ankle, or externally rotate the whole leg and hip. When we just turn out the lower leg, this can put undue stress on the knee, because one is facing forward and one out. Then imagine putting load onto that asymmetry-running, crossfit, etc. Add foot instability, or collapsed arches, and there is an issue! The video shows how gait changes a bit on that one side. 4. Hip woes- So the cause of this external rotation could be tight muscles on the same side hip, which in turn prevent the hip from turning internally as needed. (AKA. Your abductors are adaptively tighter than your adductors). This article fantastically explains how this happens. What that means is that one side of the body may in turn be shorter than the other, and there may be discomfort on the side of the hip. In the end, the goal is to at least keep both legs in the same plane to start (one leg is not in front of another). If you have extreme turnout, or have been turning out for many years, then gradually strengthening your adductors and slowly changing stance is the way to go. If the body is exploring a new range of motion or posture, it won't be sustainable to stay in the "new normal," but it would be over time.